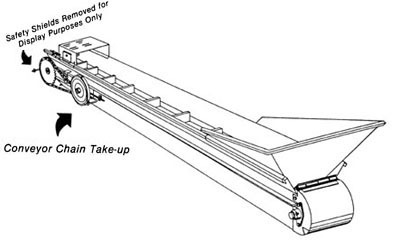 Heavy-duty, full-width cross shaft and chain final-reduction drive standard on all conveyors. Flights are closer spaced and have wider, steel backs than many other brands... for faster feed delivery and minimum rideup. Set up and ready to go (just mount motor and install safety shields). We test-run each conveyor before shipping.